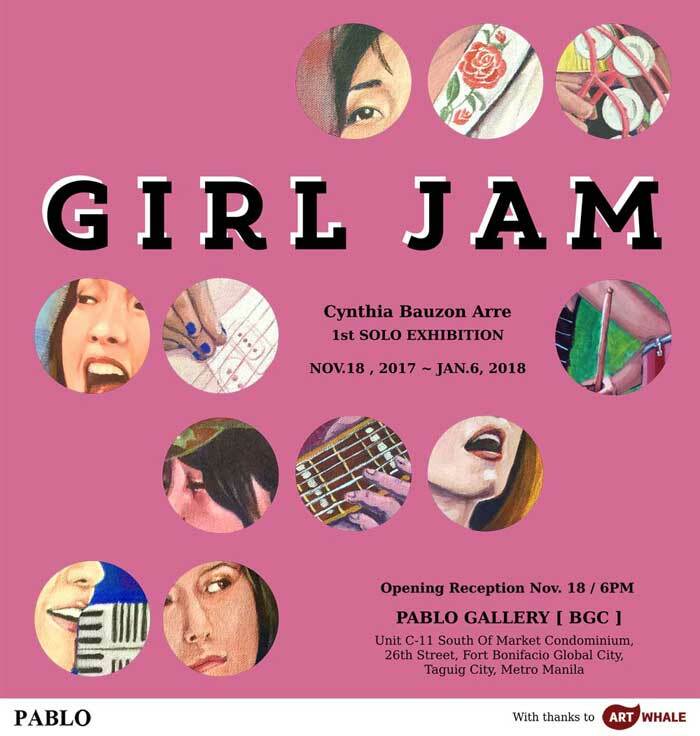 My first solo exhibit – “Girl Jam” at Pablo Gallery BGC | Cynthia, inside. A friend from the music scene days, Indi, wrote me privately to say that she would love to see me paint local female musicians. I loved the idea but I wasn’t confident enough at the time so I said to her (and apparently to the Universe? ), “maybe someday.” I forgot about it but somehow I got obsessed with drawing portraits and capturing accurate likenesses, as you will see if you scroll down to around 2-3 years ago on my IG. Drawing and painting everyday I really did improve. By late 2016, when I had already been selling art prints online for a year I was trying to think of what series to draw next and then I remembered that conversation with Indi. So I asked a female musician friend, Myrene of Sandwich, if I could paint her and she said yes which was awesome. <3 When I had lunch with my friends, writer Chinggay Labrador & artist Christina Dy, I mentioned that I was going to make a postcard series starring female musicians but then CDy said, “postcards? Why not have an exhibit instead?” I was surprised because it was an idea playing in my head too but I guess I needed a boost from someone else? She encouraged me to contact a gallery then & there. Pablo was top of mind since I had already taken part in two group shows at their Cubao X gallery years ago and I also remember promising the owners, Yo & Osie that I will have my first ever show with them. So when I texted them, it was an instant yes and my show was almost immediately scheduled! No turning back anymore. Once I had the look figured out it was time to decide on my muses. I made a list but I also asked my friends Buddy & Raymund (formerly of the Eheads) for suggestions on who else to draw — particularly from the younger set — since I wasn’t that immersed in the local scene anymore. After finalizing my list I finally got to work. This was in July 2017. I have to be honest, I was thrilled to be working on a personal passion project but there were also times when I would cry out of frustration & exhaustion. Sometimes I felt like giving up, but it was the thought of making my family & also Arnold proud that pushed me to go on. In the end I decided to just let go because I know that I gave it my all.